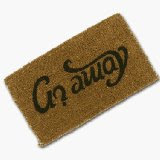 A very cool and clever doormat that reads "Come In" when walking in and "Go Away" when leaving. This is an all natural, coir style doormat and measures approximately 27 inches x 16 inches x 0.75 inches thick. Makes a great gift idea for many occasions!